Summer is here and I have loads of berries!! What to make? What to make?? 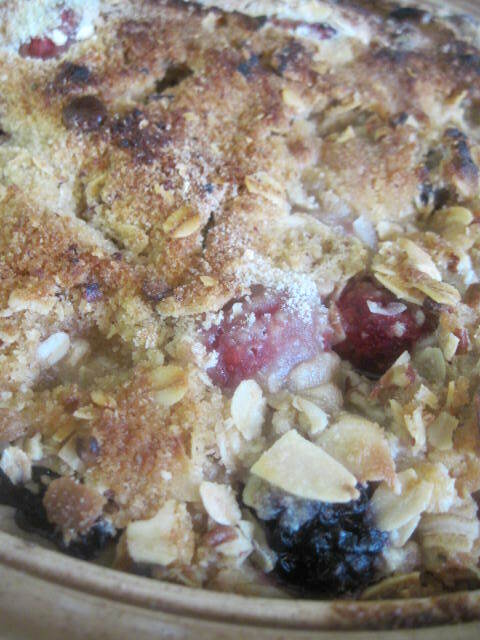 A berry crumble!! I couldn’t decide what to call this Crumble. So many gorgeous berries and toppings! 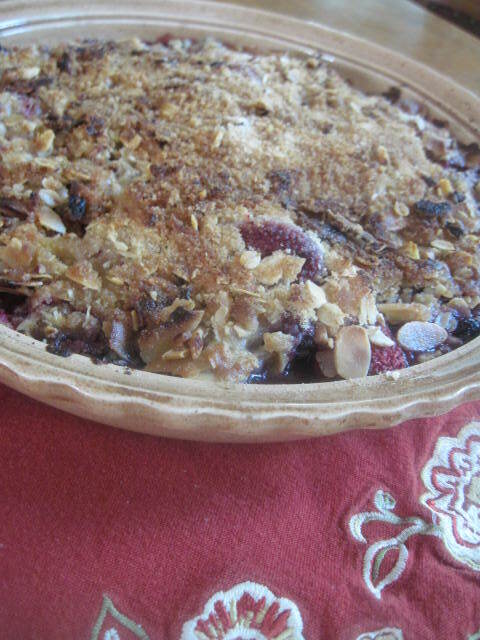 ( Strawberry, blueberry, blackberry, raspberry, coconut, almond, pecan Crumble) PHEW!!! 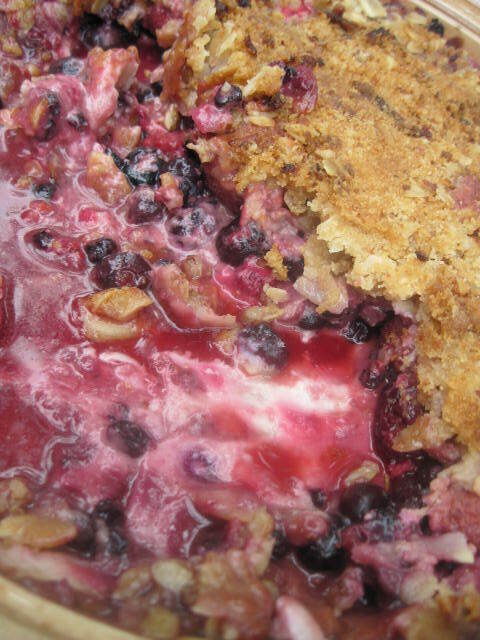 What a mouthful, so I came up with Very Berry Nut Crumble, much better, but so many goodies are included in this gorgeous PIE, or as we say CRUMBLE!! Stir together flour, sugar, oats, and salt. 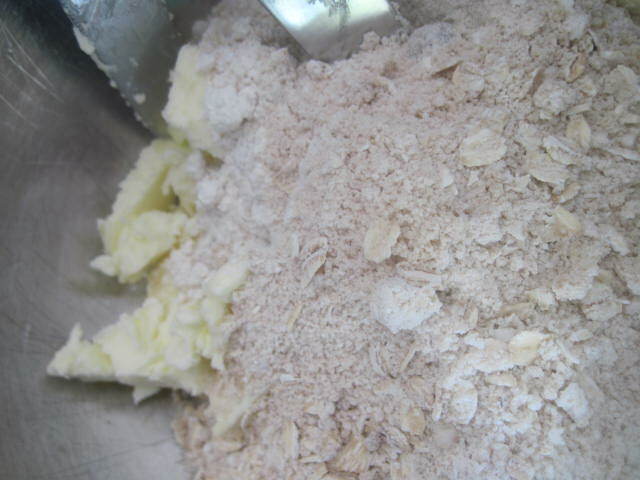 Add cold butter slices to dry mixture and cut up with two knives. Cut, cut, cut, I sound like a movie director!! 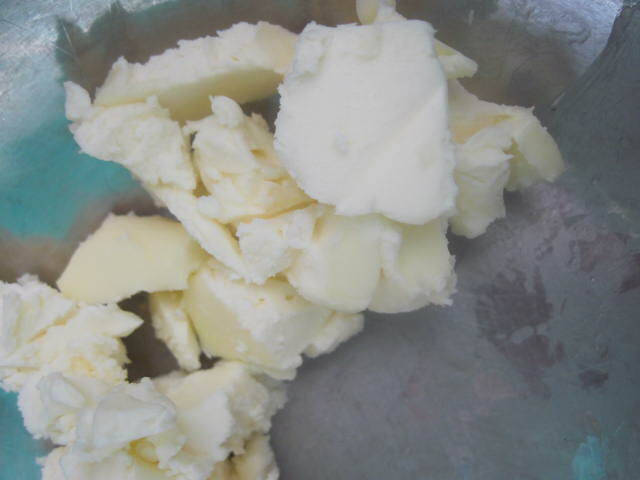 Keep cutting up until butter is in small pieces. 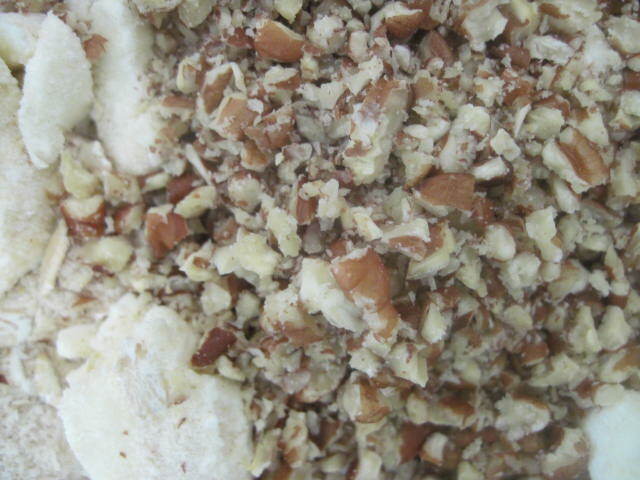 Ground up nuts give the Crumble a beautiful flavor. 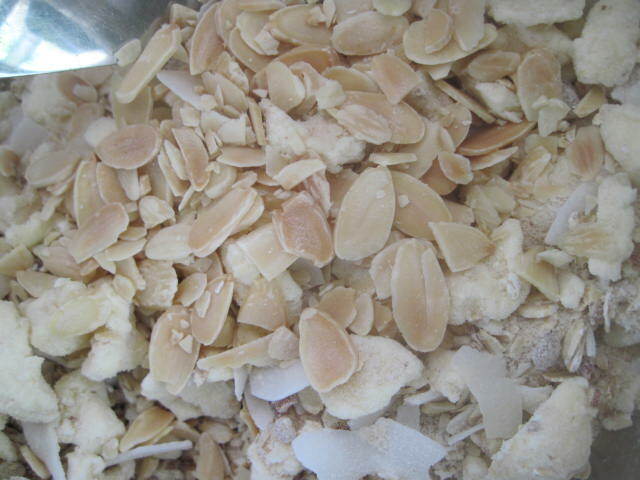 Add Roasted Almond Slivers. Mix topping thoroughly. Cover fruit with topping and bake! Make sure to place dish on a baking sheet, this will bubble and may spill over! 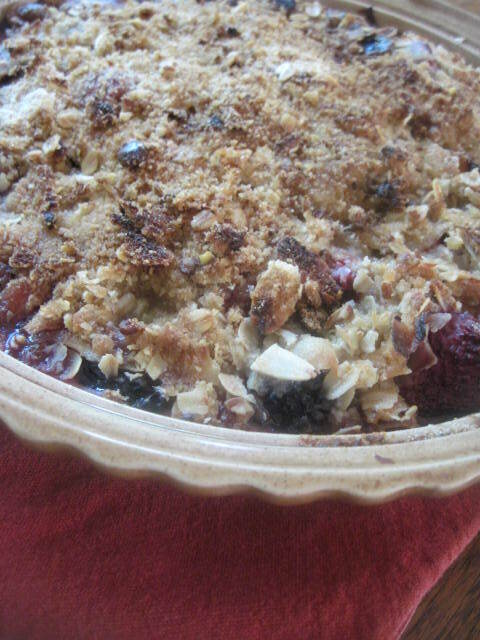 Very Berry Nut Crumble goes FAST in our home, I wish I had made two!! 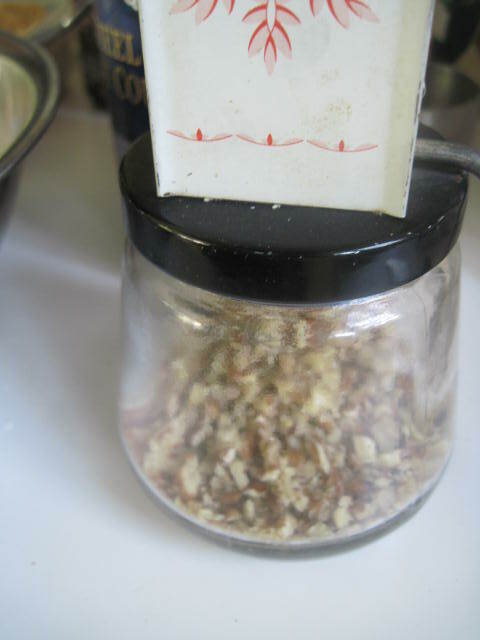 Now if you don’t have Pecans, you can substitute Walnuts or Macadamias, or whatever is your favorite! Perfect for a Pie Party or just for dessert! Can’t wait until the next Pie Party! Really delicious! The berries and nuts work so well together with the creaminess of butter. 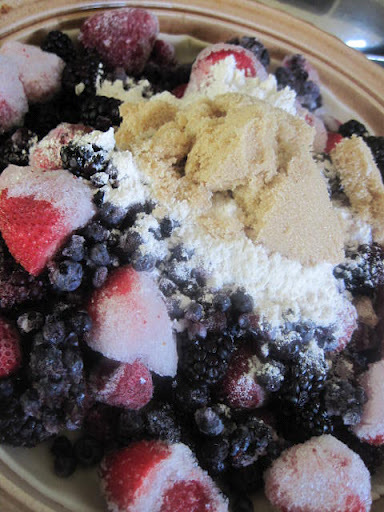 NOTE: Berries really cook down, so don’t be afraid to pile the berries in! Preheat oven to 375 degrees. 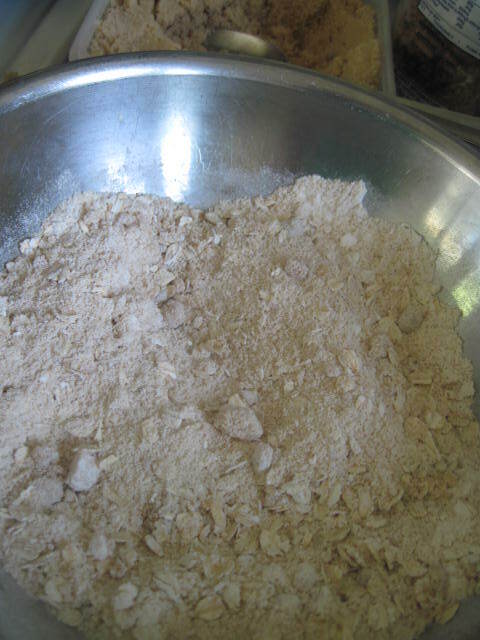 In a medium bowl, stir together 1/2 cup flour, 1 cup sugar, oats, and salt. 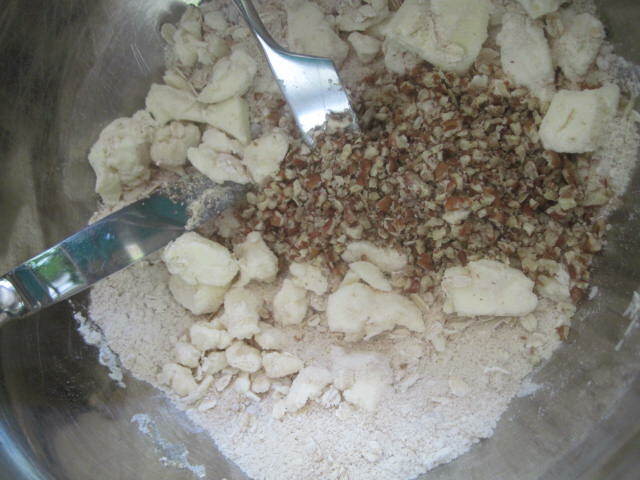 Using a pastry blender or two knives, cut in butter until coarse crumbs form. 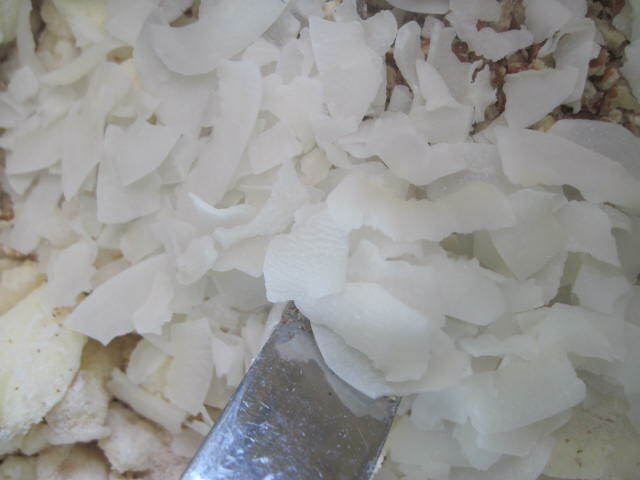 Add pecans, coconut and almond slivers to oat topping. 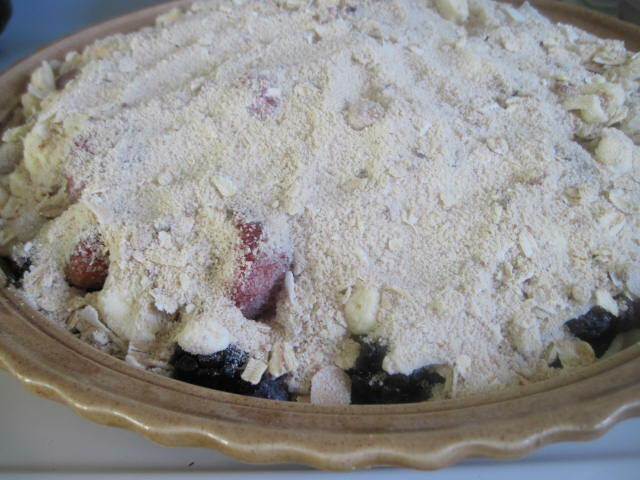 In a shallow 2-quart baking dish or 9 inch Pie Plate, toss berries with remaining 2 tablespoons sugar and 1 tablespoon flour; sprinkle with oat topping. Place dish on a rimmed baking sheet. Bake until topping is golden brown, 40 to 45 minutes. Let cool 20 minutes before serving. 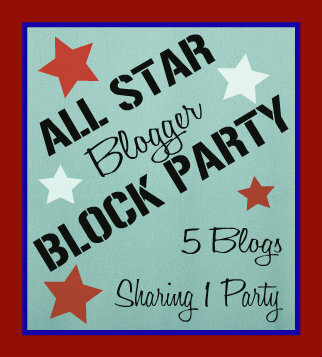 This post has been linked up to these fabulous BLOGS! This post has been FEATURED on these blogs! It looks really delicious! I love blueberries! 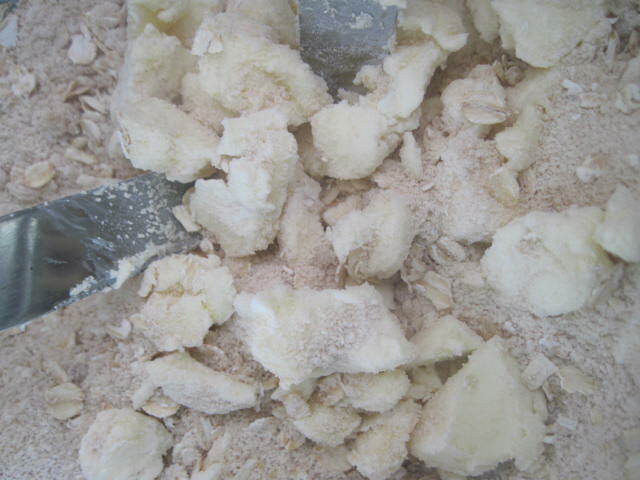 The "extras" you added to your crumble are over the top — no more plain crumble for me! YUM! Good morning, Nettie! 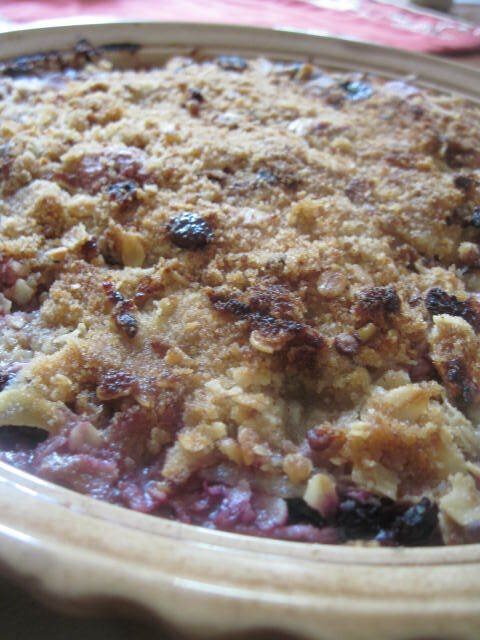 That looks absolutely delicious and the lovely twist on plain crumble….I love it:) Thank you for sharing it! Thanks so much for sharing this on Manic Monday. I adore berries so this looks fantastic!!! Mmmm, that just looks so delicious! Summer comfort food! Mmmm I love the idea of the nuts in a crumble. I can't wait to make this recipe, Nettie! Thanks for sharing! 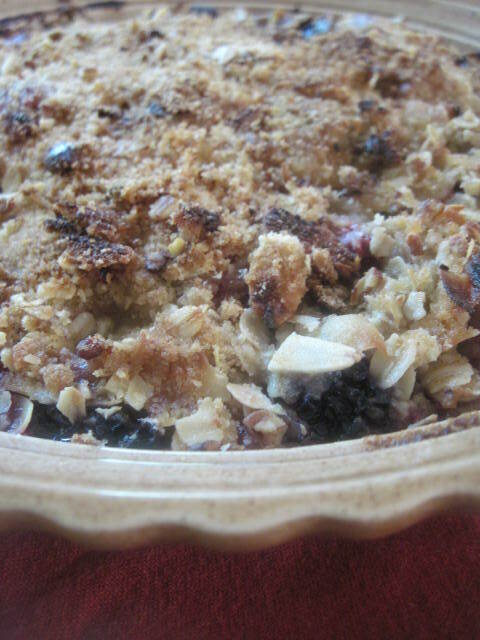 Crumbles seem to be liked by everyone and this one looks worthy of all the attention. Thanks for sharing it in the Recipe Box. Nettie, this is just perfect, I just want to lick the dish with all that wonderful syrup that left at the bottom. 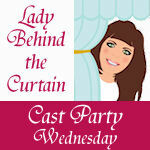 I'm featuring this at tomorrow's Thursday's Treasures. Thanks for sharing! Hi, I am happy to share, this is a featured recipe in the Recipe Box, this week.